All manner of MOT failures take their final ride to the scrapyard in spectacular style – these drivers just do not know when to back off! Jack-ups, head-ons, rollovers – all are part and parcel of any typical National Banger meeting. A huge variety of cars from tiny hatchbacks to huge American limousines can be seen in this formula, with all kinds of specialist events such as Vans, 4x4s, classic cars, team races and much more providing incredible variety and huge entertainment as the drivers smash and bash their way around the ovals, trying to keep their car running while destroying their opposition. Incarace stage some of the biggest events on the National Banger calendar, including the Civil War at Hednesford, the 2 Litre World Championship and the Champion of Champions at Birmingham, and a National Banger World Series Round at Northampton at Easter. In between there are plenty more crashing sessions across the three raceways. Spedeworth / Incarace are pleased to announce the points system for the National Bangers registered to Incarace in 2018/19 upto the end of the 2019 season. The chase for qualification to the 2019 Unlimited National Banger World Championship begins straight away. For 2018/19 drivers will score points solely on the World Qualifying chart. There will be designated World Qualifying Rounds where points are scored on every race. For all 2018/19 championships (home and away) drivers will be seeded directly from the World Qualifying Points Chart. At World Qualifying Rounds whether the meeting is run under Spedeworth or Incarace, a drivers points will go on their registered promotions chart providing the round is designated on the relevant promotions world qualifying procedure. *:- Full attendance points can only be scored if the driver has booked in advance for the meeting and the booking is accepted during office hours – Monday-Thursday 9am to 5pm & Friday 9am to 1pm. A driver turning up without booking in will score only 5 attendance points irrespective of the announced number of attendance points allocated to the event. The following meetings carry a Wildcard place where the winner of the final carries an automatic spot into the World Final race at Ipswich on 5th October 2019. These meetings carry race points on each race (except the meeting final) going from 10 for a race win, then down to 1 point for a 10th. In the Meeting Final the points are handed out as follows:- 20, 18, 15, 12, 10, 8, 6, 4, 2, 1. These meetings carry race points on each race (except the meeting final) going from 10 for a race win, then down to 1 point for a 10th. In the Meeting Final the points are handed out as follows: 20, 18, 15, 12, 10, 8, 6, 4, 2, 1. Not applicable for the 2018/19 qualifying procedure. Saturday 26th October - Birmingham - Micro Madness - 25 points (1st points scoring meeting towards the 2019/20 World qualifying procedure). Saturday 23rd November - Birmingham - Unlimited - 15 points (2nd points meeting towards the 2019/20 World qualifying procedure). 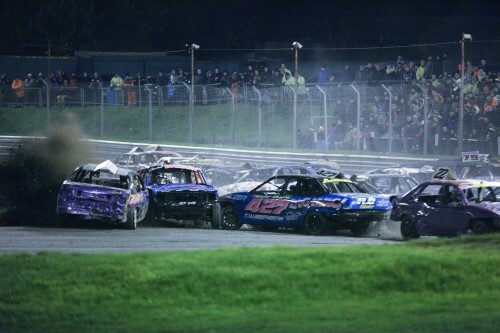 Drivers booking in for any National Banger meeting, failing to cancel, and not showing up, will have the relevant points for that meeting deducted from their total – i.e. if they would have scored 10 points for attending that event they would have 10 points deducted. The top 5 Incarace registered drivers will qualify for the World Final.